This column was written by Michael Yon. In Afghanistan, heroin has become the Devil's cocktail. "Smack" is already one of the most addictive and destructive drugs on Earth, and now numerous academic studies show addiction levels on the rise, particularly among younger children. 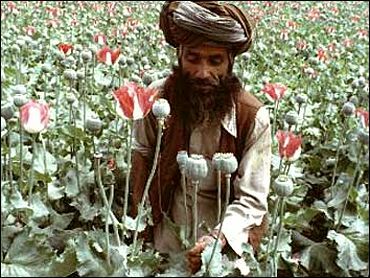 In the place where 90 percent of the world's heroin supply originates, the Taliban, al Qaeda, and others harvest profits from opium poppy cultivation to buy weapons and equipment used to attack soldiers and civilians engaged in a mostly stalled reconstruction mission. A reverse symbiosis is at work: Those who benefit most from the opium/heroin trades also benefit most from a destabilized Afghanistan, because a stable country with functioning government systems, reliable security forces, and a framework of laws is a bad climate for the drug trade. Conversely, farmers growing crops such as cotton and beans benefit from a stable government climate, which affords the opportunity to think beyond the next crop cycle. In order to make agriculture a more successful business venture, farmers need a stable government as a partner. But since the interests of poppy farmers and narco-kings are in aggressive opposition to any plan to stabilize Afghanistan, this partnership is not even in the talking stages. According to a GAO "Congressional Report on Afghanistan Reconstruction," approximately half of Afghanistan's economy is based on opium, meaning roughly half the economy thrives in a chaos that also funds world-class terrorists. Experts who study the calculus of the narcotics trade know that the problem is growing out of control in Afghanistan because every additional poppy lanced for its opium unleashes an oozing flow of black-market dollars. Those dollars are not taxed by the Kabul government, but by the virtual government of the Taliban. Perversely, poppy farmers grow poorer with each successively larger crop, because their bounty boosts supplies while driving prices lower, and they need to grow more each year just to stay even. 2006 was a bumper year for the poppy crop — the largest harvest on record. In the 2006 World Drug Report, the U.N. estimated that there was only a 2-percent eradication of potential opium production in the previous year. According to locals I interviewed about this "eradication," workers went out, slapped down a few fields with sticks, paid farmers for the poppy, and made photo ops. But at the same time, many workers left reconstruction jobs en masse to complete the poppy harvest; 98 percent of the crop survived, and it has begun to make its way to millions of addicts in Asia, Europe, and North America. This seasonal work-boon causes setbacks for road and infrastructure projects. Given that nationwide dissatisfaction with the pace and progress of reconstruction efforts in Afghanistan has now grown to such a level that concern about it is factored into reports and plans from the U.N., NATO, and the GAO (among others), this is just another example of the expanding zone of erosion that threatens to undermine all progress on all fronts in this battered country. Heroin addictions are increasing around the globe. Here at home, there will be more addicts crawling through windows at night robbing houses and stealing jewelry to score drugs, just as they will be in Brisbane, Berlin, and London. According to health studies, the heroin now landing on the streets in Europe and America is increasingly pure. Many users continue to inject the drug, but because of the increased purity, some children are sniffing or smoking heroin, relying on a dangerous rationalization that "real addicts" always inject. Kids also are mixing heroin with other drugs such as cocaine, causing a spike in emergency-room visits and explaining the rise in drug related injuries and deaths for middle-school students. With burgeoning heroin supplies, lower street prices lower the addiction threshold, resulting in more heroin addicts. And when addicts use heroin over time, they need more and more to feel the high. Afghan farmers will likely oblige by planting more. Despite the increasing human toll levied by opium production in Afghanistan, there is still no coherent plan for stopping the violence, shutting off the flow of money to the enemy, and eradicating and replacing poppy in Afghanistan. Thousands of tons of opium from this year's harvest are being processed at this moment, and much will be used to make the heroin that is about to flood our streets, all while the its monetary equivalent will be stuffing enemy pockets in the next few months. We are seeing the results on the battlefields of Afghanistan. Instead of the planned shift toward stability that was expected to be far enough along to enable us to draw down U.S. troops and turn over the security operations to NATO forces, the Taliban has resurged, re-armed, regrouped, and re-emerged as a serious military threat. In early July 2006, an Afghan truck driver for the Central Asian Development Group (CADG) was kidnapped between Camp Bastion and Lashkar Gah on a road that I had recently traveled. The surrounding area is a full-on battlefield every bit as dangerous as Iraq. When the driver was kidnapped, the owner of CADG, Steve Shaulis, immediately called his Lashkar Gah branch office to ask which village his man was from. Shaulis then dispatched an employee to the village to inform the man's family. As Shaulis told me, "I also informed — of course — the government and the Coalition, but — of course — they could do nothing more than take the information with a vague sort of promise to look into it." While the Coalition and the Afghan government apparently fell inert on the matter, the victim's family went immediately to the Taliban — who have a functioning structure in these parts — and secured the release of the man without ransom. Shaulis wasn't so lucky in getting his truck back, however. But since he's had other incidents with less fortunate outcomes, a truck is an easy loss to absorb. While I was in the province, an ambush of CADG trucks occurred, during which one of the drivers was murdered and another wounded. This area has become so dangerous since my departure that Shaulis has been forced to lease an airplane to visit his projects. There is a widespread notion that Afghanistan is safer for our troops than Iraq, yet Coalition and NATO combat deaths in Afghanistan are per capita nearly identical to those in Iraq. In 2007, it looks as if per capita combat deaths will likely be significantly higher in Afghanistan than in Iraq. Why? There are many reasons, but one of the most important is that our European allies have been slow to recognize the reality that a monster really is under the bed. After years of neglect and dawdling, they are finally beginning to adjust, but they are still not keeping pace with the threat. They are still not providing their people with proper equipment, all while the Taliban is getting stronger from the billion-dollar narcotics backwash that floods enemy coffers. As in Iraq, troop numbers are also dangerously low in Afghanistan, and the handfuls of friendly forces there lack sufficient air power to stretch their security resources. NATO is tentatively confronting the proximate and growing threat by sending more troops into battle, but they are sending troops with insufficient force protection. During my trip, I visited several bases. To convey just one exchange, but a revealing one: Shaulis needed to meet some Danish engineers who were to fly into Tarin Kot the next day by helicopter. When Shaulis asked an Australian special-forces officer how to identify which helicopter the Danish engineers would arrive in, the Australian officer grimly answered, "It will be the only helicopter flying alone." According to retired four-star Gen. Barry McCaffrey, who recently returned from a trip to Pakistan and Afghanistan: In my view, there is little question that the level of fighting has intensified rapidly in the past year. Three years ago the Taliban operated in squad sized units. Last year they operated in company sized units (100+ men). This year the Taliban are operating in battalion sized units (400+) men.Afghanistan is the new hot war — and it's getting hotter. Michael Yon blogs at michaelyon-online.com.